Those that know me know that I love games, and though I don't tend to review them often (often due to their complexity) I just received Cardwright's Sushi Go! for Christmas and this cute little sushi themed game turned out to be quite a treat. Played over three rounds, the easy to learn game sees you trying to rack up the highest score by collecting sushi cards in different combinations. 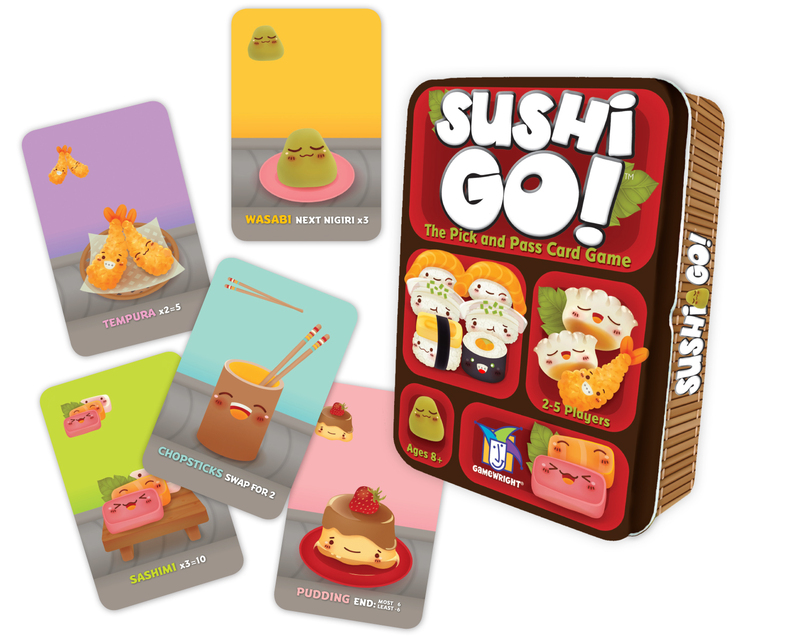 With a bit of maths, strategy and a tiny bit of sneakiness, Sushi Go! provided our family a lot of fun yesterday, making us want to play again and again. It seemed to be pretty balanced as well, given we were almost always within 5 points of each other- and my mum, usually not fond of games, won two out of the three games we played! But Sushi Go! would not be what it is without the uber-cute and graphically clean aesthetic- the drawings are adorable and packaged in a bento tin box, reveals its thoughtful design. At a retail price of around £10, Sushi Go! is a steal- it will bring your family, young and old, hours of joy.